Members of the LA Equity Alliance at a speakers training held on July 23, 2015. As the legislature session wound down last week, finalizing which bills would pass this year, we saw that California is at a pivotal moment. Our state legislators are forging a climate-conscious path that will shape our economy, health and environment in the decades ahead. While much work is still needed to extend and increase our pollution reduction goals, to regulate non-renewable energy industries, and to develop a just transition to a clean energy economy that is inclusive of low-income communities of color, existing climate justice legislation is already starting to bring investment into the communities most impacted by pollution, poverty and poor health. The California Air Resources Board (ARB)—whose mission is to promote and protect public health, welfare and ecological resources through the effective and efficient reduction of air pollutants—is the regulatory body at the helm of the state’s current efforts to reduce harmful greenhouse gases. The ARB is tasked with: 1) developing guidelines to allocate funds raised from the state’s highest polluters to local communities; and 2) guiding the legislature’s short-term and long-term greenhouse gas reduction goals. 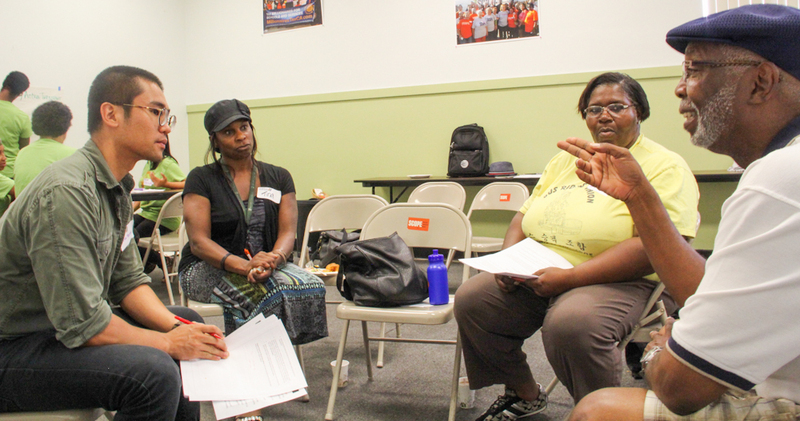 Community members share their vision for a healthier South L.A. The Los Angeles Equity Alliance—a regional alliance of community organizations, advocates, and environmental groups led by SCOPE and a cohort of South Los Angeles-based organizations—is dedicated to building broad support for strategic climate investment in low-income communities. And while California is a global leader in climate change and environmental justice policy, we understand that if we are to achieve our goal, we need to hold our decision makers accountable to the true intent of these pieces of legislation. The LA Equity Alliance is concerned with how current climate and clean energy policy will benefit struggling local economies, low-income job seekers, and neighborhoods that face multiple barriers to achieving community health. For this reason, SCOPE and the LA Equity Alliance have been organizing to ensure that grassroots community voices are heard in ARB meetings. At a recent hearing in July, the ARB’s staff was struck with the participation of South L.A. residents. SCOPE member Maria Rutledge’s personal story about the need for jobs and training in disadvantaged communities spoke to the fact that the implementation of climate policies will not only impact our environment, but also create a significant shift in our economy that should lift up everyone. Mrs. Rutledge stated that the growing green economy should be inclusive to disadvantaged communities so that South L.A. youth and other low-income job-seekers can simply see models of good quality jobs and healthy working life. “How can we expect our young people to dream about what they want to do when they grow up when many of their parents are struggling to find stable, quality work?” said Maria. 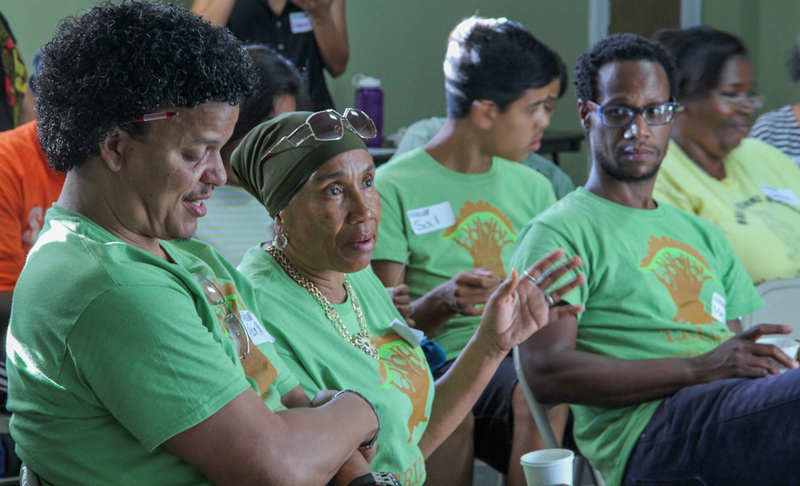 Visible advocacy from low-income communities of color and a narrative centered on those on the frontlines of climate change and systemic disinvestments are a result of the LA Equity Alliance’s organizing strategy. Our members have been engaged in house meetings, trained as spokespeople, and asked to share their stories as leaders. As a result, when members spoke to the ARB, the conversation was reframed around the communities that stand to receive real life-changing investments. T.R.U.S.T. South L.A. member sharing her experiences on the kind of pollution she sees in South L.A.
Our state is unique in that it has several pieces of legislation that speak to the need to ensure that climate investments not only reduce greenhouse gases, but address compounding issues related to poverty, unemployment, poor health and air quality. However, there remains a lack of emphasis on systemic issues such as long-term disinvestment and environmental racism that must be addressed through an equitable and just policy implementation strategy. LA Equity Alliance members want investments in greenhouse gas reduction to be strategically leveraged to ensure disadvantaged communities are less vulnerable and more resilient to the impacts of pollution and climate change in the future. This means that our state’s disadvantaged residents have realistic opportunities for training and good jobs in the clean energy sector and can enjoy the fruits of investment in transit and affordable housing, without threat of displacement. Through our organizing, advocacy, and strategic partnerships, SCOPE ensured that ARB staff heard our concerns. After a joint letter and repeated public comments in August, the ARB responded by providing more transparency and space for public engagement in their implementation processes, and reaching out to the LA Equity Alliance for further discussion. As the ARB goes on to approve their final funding guidelines for greenhouse gas reduction programs on September 24, the LA Equity Alliance will continue to organize community members and build the power to push for equitable outcomes. Communities like South L.A. face systemic disinvestment and marginalization that go back decades. This history-shifting moment can provide a real opportunity for low-income communities of color to be at the table and partner with decision makers to shape better policies, drive a just investment strategy, and redefine our future.